Personally I think no, journaling is not enough in its most simple form. However, you can enrich the task of journaling and make it much more if you are prepared to put in a little bit of effort with your child. The simple task of a journal can tell you a lot about your child’s knowledge and abilities and their weaknesses and strengths. In my own personal view, I consider journaling as a perfect starting point, the place of inspiration. That one journal can guide the bulk of your teaching. If your child is 5-7 years of age, ask them child to identify the day, month and date. You can pose the question “What day was it yesterday?” and “What day will it be tomorrow?” This will help them learn the days of the week, the months and understand how many days are in a month. This task will teach them to spell the days of the week and months and also identify that these things are proper nouns that require capital letters. Ask them to locate on a map where they are. 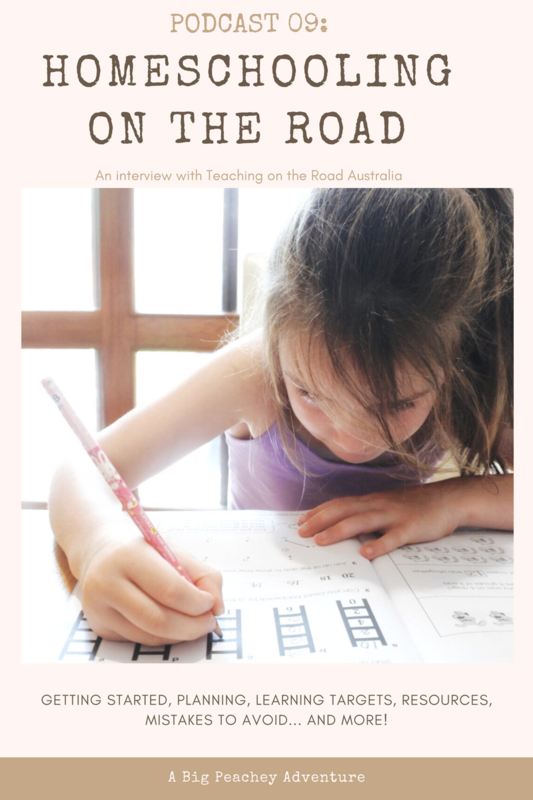 Print a map, draw a map and mark each time they do a journal where they are and write their location. This will help develop their knowledge and understanding of Australia, distances and enhance their geographical knowledge. Discuss with them which events would you like to go back and read about when you read that journal. This helps them to consider the audience of their text (which is a recount). Is writing about what you ate for lunch interesting? Would you want to read about that in a year? 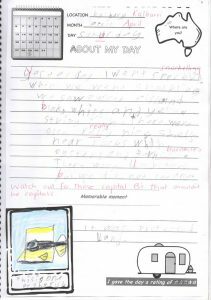 For the later years of primary encourage your child to write in great detail describing a few events from the day rather than simply listing the things that they did. 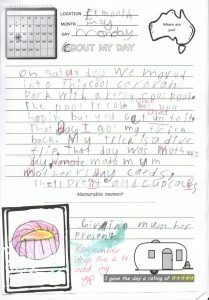 Ensure that your child is able to write in past tense, and if they are not then this is something to work on in their journal and creates discussion for you. When writing, encourage them to use time connectives like today, yesterday, on the weekend, first, next, last, finally, eventually, soon after and so on (you can Google time connectives for some more inspiration). Ask your child to personally reflect on their day. I do this by asking them to write a memorable moment (or positive moment) and to give their day a rating out of 5 stars. This allows them to stop and consider how they felt about their day. It also creates a talking opportunity. When you realise that your child has rated the day with a one star you would obviously want to talk to them about why that day wasn’t enjoyable. Asking them to write a memorable moment allows them to find something positive in their day and focus on a positive mindset which will contribute to their overall happiness within themselves. If you have a child who is in the later years of primary then I would also recommend that you encourage your child at the end of every journal to write three questions. Maybe it is three things they would like to know more about or it could even take on a more personal perspective. 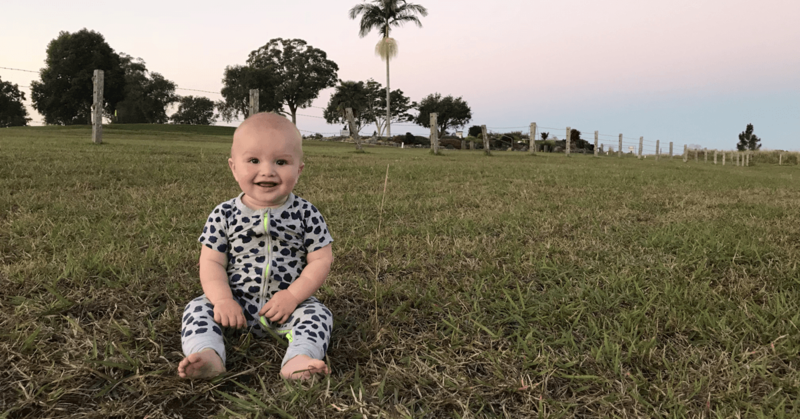 These questions may lend themselves to opportunities for conversations that wouldn’t otherwise arise or even research opportunities that will expand your child’s knowledge and research abilities. Once written you could also encourage your child to draw a picture, print a photo or even glue in some brochure cut outs that are relevant from the day. This could extend further into an opportunity to use other media like oil pastels, water colour pencils or exploring techniques like cross hatching. Prior to your child closing their book and saying they are done you should prompt them to review and check their work by saying “Go back over your writing and read it yourself”. “Have you included full stops, capital letters, paragraphs or any other punctuation?” Keep the punctuation prompts relevant to your child’s age. Occasionally ask your child to read you their journal. This will build their public speaking skills and funnily enough when they read it out loud they will hear their mistakes. If they are not confident reading it out loud then you should ask them to do so more often. Focus on shoulders back and down, chest proud, confident voice. Ask questions like “Did that make sense?” If they read you a sentence that is incorrect. At this point, YOU should read and reflect on what they have written. Look for spelling mistakes and consider if the spelling mistakes offer you a teaching opportunity. For example does your child know that er/ur/ir all make the same sound and when to use them. Do they know how to add suffixes to a word and the rules that accompany them like ‘drop the ‘e’ to add ‘ing’ in making, baking, creating. Check that they are writing challenging sentences (we call them simple, compound and complex sentences). Make a note of spelling errors and over a fortnight come up with some mini spelling/grammar lesson opportunities. If you want to take it further, encourage your child to go back over their writing and underline the nouns in one colour, verbs in another, adjectives, pronouns, etc. This will help you discover if your child knows what they are and can identify them. This can be particularly useful to identify adjectives and ask them if they have used enough adjectives to make their writing interesting. Finally, each week you might like to take something from their journal and ask them to research it further. It could be a simple as research and write about an animal that we saw this week, a place that we have been to and further research a significant sight. By doing this you have done so much more than just write a journal. Let’s consider how many outcomes from the National Curriculum you could touch upon. For the sake of this example, I have based these outcomes on a Year 4 level. Re-read and edit for meaning by adding, deleting or moving words or word groups to improve content and structure. Incorporate new vocabulary from a range of sources into students’ own texts including vocabulary encountered in research. Describe and compare the characteristics of placesin different locations at local to national scales. NextFree Camping 101: Which Battery is Best Bang for Your Bucks?